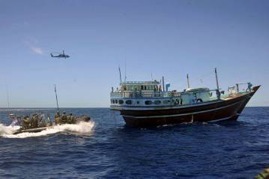 Warships operating as part of the Combined Maritime Forces (CMF) have successfully conducted an operation aimed at disrupting illicit activity in the Indian ocean. Combined Task Force 150 (CTF150), conducted counter-terrorism Focused Operation Southern Sweep between Monday, 25 March 2013 and Monday, 01 April 2013. 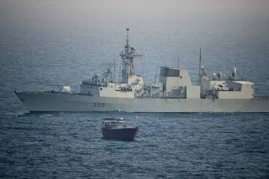 Key units involved in the operation included HMAS Toowoomba and HMCS Toronto. HMAS Toowoomba’s boarding party, supported by their Sea Hawk helicopter, approaches a dhow for boarding. During the Focused Operation Toronto successfully disrupted a massive heroin shipment. 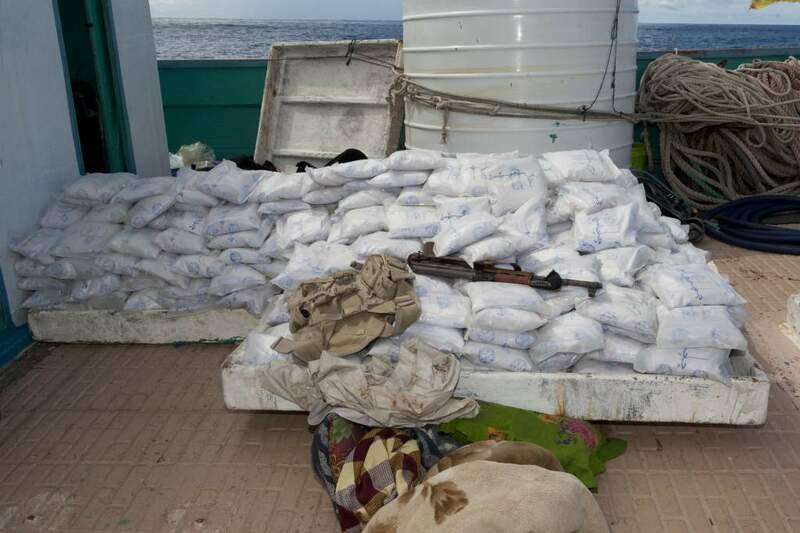 The crew of the Canadian warship searched a suspect vessel in the Indian Ocean off Zanzibar Island, Tanzania and found almost 500kg of heroin stowed in hidden compartments. 500 Kg of heroin seized by HMCS Toronto during Focussed Operation Southern Sweep. The Commander of CTF150, Commodore Charles McHardie Royal Australian Navy, said that the Focused Operation provided a valuable opportunity for engaging with regional authorities in the southern part of the area of operations. “Focused Operation Southern Sweep has brought the resources of the Combined Maritime Forces and partner agencies into the southern reaches of the area of operations,” Commodore McHardie said. “The breadth of the area of operations means that it is vital that CMF maintains close working relationships with our regional partners. During Southern Sweep the warships Toronto and Toowoomba interacted with personnel of the Kenyan and Tanzanian navies and the Seychelles Coast Guard. HMCS Toronto positions herself during the boarding of the suspect dhow, later found to be carrying 500 Kg of heroin. A Seychellois officer embarked in Toronto during the operation, providing valuable local knowledge and insight to their operations. Commodore Simon Ancona Royal Navy, Deputy Commander of CMF, dais: “Focused operations like this are a lynchpin of our efforts to provide maritime security and stability across our operating area. “By combining accurate intelligence, careful observation and monitoring, and the experience and expertise of our operational units, Focused Operation Southern Sweep has been a great success and the teams involved can be justifiably proud of what they have achieved. During Focused Operation Southern Sweep CTF150 targeted the region’s historical maritime smuggling routes, working alongside both regional authorities and warships from Australia, Canada, France and the United States. The smuggling of narcotics in the region is a recognised funding source for terrorist organisations. By interrupting the narcotics trade CTF150 is able to deny financial resources to extremist groups.